After Many months, i felt like watching cricket today, and i started watching The final of IPL season 2. Deccan Chargers vs Royal Challengers. My favorite was Bangalore team, The Royal Challengers..... Royal Challengers bowled well, and restricted the opponent to a total which they can get. But the batting failure of Royal Challengers haunted them in the finals and they just lost badly. And the History repeats, Whenever I get interested in Cricket and watch a Match, My favorite Team loses, and so is my interest on cricket. I just end up spoiling my mood again trying to be a cricket fan. Yes, The Final Match of IPL, Deccan Chargers vs Royal Challengers is Over, and Deccan Chargers have come up as Champions of IPL season 2. Now why on earth Linux is FUN when everyone says it's so Complicated....?? Linux is Fun because Linux is complicated..... :) Everything is a challenge in Linux, challenges make you learn many things. So what is the first challenge i faced in Linux?? I want to say a few things, but i just can't say them. I want to bash someone, But i can't just do it. I want to make everything go fine, but it is just too hard for me. I want to achieve something, but time always keeps running out. I want to make everyone understand what true potential is, But no one is interested. I want to live life Independently, but i am missing the key. I want to go out and scream loudly, but in crowd no one cares me. I want to see people happy, but somehow they find a reason to be unhappy. I want to make a point in this world, but the pen is just not sharp enough. Once upon a time when i used to play games, that time the Windows was necessary for me. But some recent developments just made me to shift my home computer to Linux. What made me to install Linux on Home system........?? My home computer is not used for any gaming now, Nor any serious work. It's used just to browse Internet,Some document editing and Watch some Media. So essentially these tasks should be handled by Linux in a breeze. But They are NOT.... !!! I always liked the Advertisements from Hutch, May be its a Boy and Girl or may be the Cute Boy and Dog. Now the Vodafone is continuing the Trend with Zoozoos. 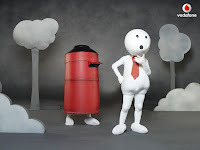 The Zoozoo advertisements do not have any of the Film Stars/Cricket Stars as brand ambassadors, but some simple characters, which deliver the message to the point and are successfully making an Impression in the viewers minds. Just go through this story to know more about the Making of Zoozoo advertisements. Making of the Zoozoo Advertisements.